Which series are doing the best? The worst? Wondering how your favorite TV shows are doing in the ratings? Here are the season average ratings of the 2013-14 network TV shows — through the end of week 27 (Sunday, March 30, 2014). ABC shows (so far): 20/20, America’s Funniest Home Videos, The Assets, The Bachelor, Back in the Game, Betrayal, Castle, Dancing with the Stars, The Goldbergs, The Great Christmas Light Fight, Grey’s Anatomy, Killer Women, Last Man Standing, Lucky 7, Marvel’s Agents of SHIELD, The Middle, Mixology, Modern Family, Nashville, The Neighbors, Once Upon a Time, Once Upon a Time in Wonderland, Primetime: What Would You Do?, Resurrection, Revenge, Scandal, Shark Tank, Super Fun Night, The Taste, and Trophy Wife. CBS shows (so far): 2 Broke Girls, 48 Hours, 60 Minutes, The Amazing Race, The Big Bang Theory, Blue Bloods, The Crazy Ones, Criminal Minds, CSI: Crime Scene Investigation, Elementary, The Good Wife, Hawaii Five-0, Hostages, How I Met Your Mother, Intelligence, The Mentalist, Mike & Molly, The Millers, Mom, NCIS, NCIS: Los Angeles, Person of Interest, Survivor, Two and a Half Men, Undercover Boss, and We Are Men. 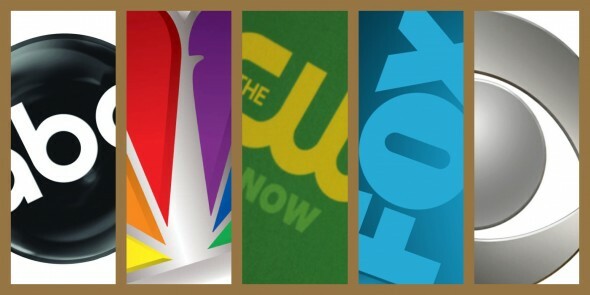 FOX shows (so far): Almost Human, American Dad!, American Idol, Bob’s Burgers, Bones, Brooklyn Nine-Nine, Cosmos: A Spacetime Odyssey, Dads, Enlisted, Family Guy, The Following, Glee, MasterChef Junior, The Mindy Project, New Girl, Raising Hope, Rake, The Simpsons, Sleepy Hollow, and The X Factor. How can they even consider not renewing great family shows like THE MIDDLE & GROWING UP FISHER? And how can they justify keeping the filth on 2 1/2 men. This show was pretty disgusting when Sheen was the star but NOW…. it’s way past disgusing. Stopped watching when Alan was always in his underwear and his niece appeared out of no where. Nothing funny about this show at all. Yes, I do make a note of who the advertisers are!